Eddie Jabbour, Creative Director at Kick Design, New York, is a tireless advocate for a new map design and communication solution for the world's most complex subway system. The NYC subway is indeed a challenge by itself. It has the biggest number of stations in the world (468), the second longest network and it's seventh in daily passenger numbers. But that didn't seem to intimidate Eddie Jabbour, who has produced a truly impressive proposal for redesigning the New York City subway map. He has made it easier to see all the different lines and made it clearer to identify the stations. The new map has not yet been released in totality, but Kick Design has put some samples out, which look exciting. Eddie's map is cute, but too confusing with all the lines and separate circles for each station. Am I the only one that thinks the current map is fine the way it is? 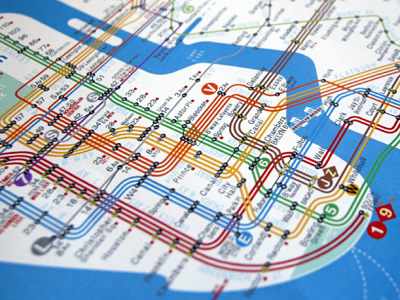 This map is amazing, especially because each subway line gets its own line! I have to strain over passengers to make out if the N goes to Atlantic, or where the Q separates, or if the E stops at 50th St. This would solve a lot of repetitive and needless map reading. How can I get a copy? I can use the London tube but still don't understand the NYC subway system after 40 years. I'm especially glad that he included stations where it is not possible to reverse direction (little orange squares on the map). As for Don Noble's suggestion, the MTA once issued a set of side-by-side geographically accurate subway and bus maps of Manhattan - quite useful. Unfortunately, it only extended north to 168th St. and a Washington Heights or Inwood politician (who obviously had nothing better to do) made quite a stink about that. The map was never reissued. Horrible. It sacrifices all geographic relevance, assuming the user has no need to know where the subway stations exist in relation to the rest of the city -- necessitating the use of a second map to determine how streets and landmarks relate to train stops. I think the map is quite an improvement on the current one. 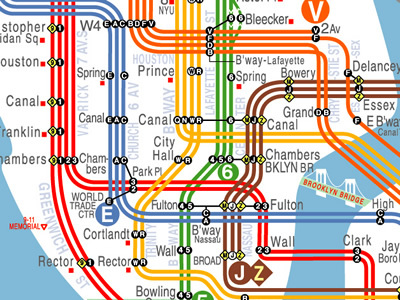 The biggest hit (and biggest deficiency in the current mta map), in my opionion, is the separating out of each line to (ta-dah) ITS OWN LINE. Brilliantly simple. Ok, now....is this map available? i see bits and pieces on this and other websites. How about a complete one in jpg or pdf? How can i get this map? It's the best thing since the powers that be did away with the IRT, IND & BMT? It's too confusing for me, but I like the colors. I dont think the everyday train rider would benifit. Its just not practical. For those unfamiliar with the term "stretched type", its what happens when, during the design process, letters, words, etc are scaled larger or smaller without maintaining the original height-to-width proportion of the font. The result is visually painful, typographically perverse and a biiigggg graphic design no-no (I have professors who would eat my face if I stretched type). So why oh why is the name of nearly every street and station set in stretched and disfigured type?! I can tell an incrrreeddible amount of time and effort went into this, but no matter how perfect a map is, if the typography is distorted then the whole piece is garbage. "Unfortunately, it only extended north to 168th St. and a Washington Heights or Inwood politician (who obviously had nothing better to do) made quite a stink about that. The map was never reissued. Posted by Robert L. Sklar on Apr 27, 2007 at 12:56 PM (GMT)" As a mapmaker and resident of Inwood this comment pisses me off. Of course "a stink" was raised. What is the point in a partial map of the system? Too often NYC is seen as just Lower Manhattan. Although the map looks nice, it isnâ€™t functional. Adding a line for each subway line is unnecessary and creates clutter on the map. Also, color-coding each neighborhood with a different hue adds to the confusion and might just overwhelm the user. The best thing about the current map is the amount of information it contains. Not only do you get a comprehensive view of the subway system, but also the major streets, neighborhoods, connections to buses, parks, landmarks, etc. The Kick design map is not as schematic as the London tube one, but it loses some of the versatility of the current map I just mentioned. More color and line work is usually not a good idea. Good exercise in cartography though. The current map shows which stops are express and which aren't, very quickly. I've used the current MTA map to navigate (walking) around the city. I could not do either of those activities with this version, which does not quickly tell me which stations are express, and doesn't give me context into the layout of the city. Please get Robert L Sklar to contact me. I think we may be related. April 20, 2007 posting from him.